You likely have been working to improve your church hospitality and increase the number of first time visitors. Once your first time visitor comes and fills out a church visitor information card (if they do), what are some next steps you might take to intentionally follow up? 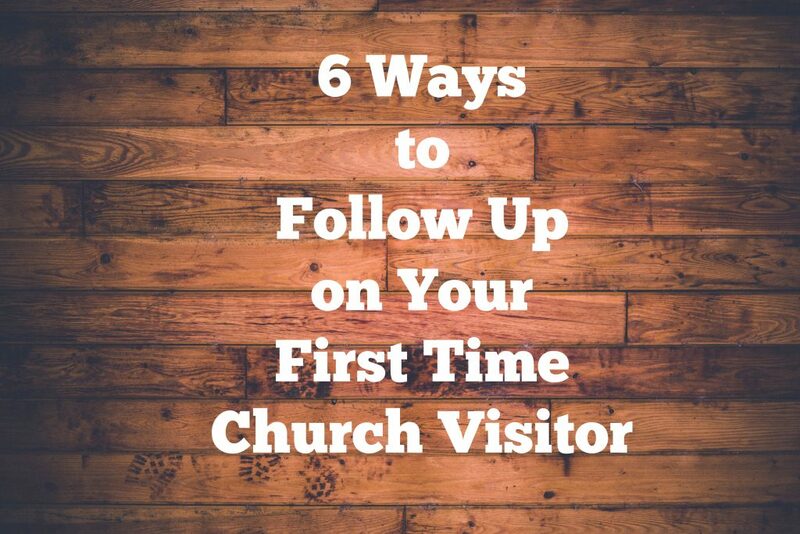 I’ve seen various statistics from church growth material over the years that indicate the importance of follow up of your first time church visitor. Your Church Visitor retention rate is highest when you follow-up with visitors w/in 48 hours. Your follow-up should be highly relational and focused on the guest when you reach out to them. If you don’t get their contact information, you can’t send them literature, make a home visit, carry cookies to their house, or invite them to come to the next service. How can you follow up with them if you have no record of their presence? Give them a church visitor welcome packet before they leave. Go to the next steps center after the service and pick one up. Greeters and other church hospitality volunteers recognize first time visitors and casually give them one while having a conversation with them. As the person goes home with a welcome packet, they might peruse it and learn more about your church, your programming, and make a decision about returning. What is the simple next step that you would like your church visitors to take? Do you want to invite them to your Wednesday night Supper? Do you want them to attend a New Guest Reception with the pastor? Do you want them to volunteer in a community service project coming on the 3rd Saturday? Maybe your next step is something simple as come back for the next part of the sermon series. Maybe it is to pick up a free book from the visitor welcome center. No matter what your next step is, your church visitor will not know if you are not clear about it. Find ways to communicate that next step for your first time church visitors. Do not assume that they will know. We attended a church for several weeks before we figured out on our own what that next step was. 3. Mail a letter with a clear invitation to a next step. Assuming you have collected your church visitor contact information, send a first time visitor follow up letter or note card of some kind. We hope that you’ll take the time over the next few weeks to discover how you can connect in a small group, or in a service ministry. We want to give you the time and space to do explore. I know that our church has a lot of great programming, but the first place your might want to check is our Wednesday night dinner and Bible Study. I’ve enclosed four coupons for your family to use over the next several weeks, so you can eat free. Come and share a meal with some potential new friends. Have a meal on us! I hope to see you there. Once your worship service is over, provide the space for people to visit. Right now in our own church, this is one of our most important facilitators of growing new members. The coffee hour allows a time for people to talk in a more relaxed environment. Church Greeters can be intentional in talking with first time visitors. Provide some seating space and maybe a few tables to help facilitate an environment for conversation. Make sure you provide quality beverages and snack items. This might be your simple next step to suggest to your first time church visitors. You might hold them monthly or every other month as needed, hold them when you can gather a crowd. You might schedule them with-in a month of a big event Sunday, like Easter, mother’s day, Christmas, Back to School. I suggest you schedule them for Sunday’s after Church to avoid conflicts with small groups and other activities. Allow for newcomers to meet some people they can relate to (other newcomers). Other newcomers can meet each other. You share simple next steps to getting involved. Information on your membership or core beliefs class. Some churches practice making home visits to church visitors as part of their church visitor follow up. Visits should be carried out by members of the church, not the pastor or other paid staff. Take place within 36 hours of the event; ideally, the same afternoon. Make it a brief front-porch visit. Delivery of cookies, bread, or some other thoughtful gift item. The goal is to appreciate their visit, leave information about the church, and invite them back for a return visit. Print a directional map from the church to First time Guest homes. Deliver a Gift Bag as a “Thank You for visiting” gesture. Collecting visitor contact information has it’s place. But the simplest form of church visitor assimilation is helping people make friends. 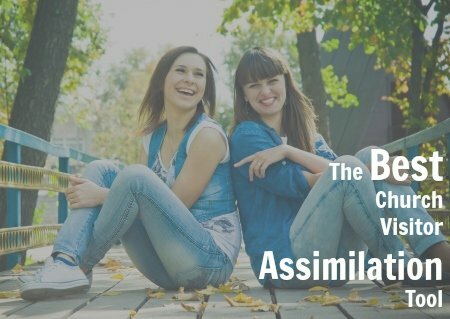 If you need help on visitor assimilation, check out this church visitor assimilation webinar that looks at 5 necessary tools for church visitor assimilation. It’s available instantly after purchase. It is a recording of an online webinar. In addition to a regular visitor bag, we have special visitor bags for children. An inexpensive toy, washable crayons, Biblical coloring page, stickers. It makes the child feel welcome and sends a message to parents that we are thinking about ministering to their kids. Those are awesome visitor friendly ideas for children. Where do you source them, or do you have them done in house? Thank you very much,it is helpfull!! Very helpful tips! Thanks so much! Excellent information and tips! Thank you for sharing your knowledge with us. At this moment I am preparing info packets for our visitors! What do you do when so many today do not want a home visit? Do you show up on their porch any way? Part of the answer to that question is knowledge of the local culture where you are. If a home visit is perceived as intrusive or unwanted, it’s a practice that may not work in your area. Churches that practice a home visit usually stay on the front porch, don’t enter, and simply leave a thank you gift with an invitation to return the following Sunday. The visit is not long at all. In my last city where I lived, I lived in an apartment buildling in a urban district surrounded by apartment buildlings. Single family homes were often in a gated community. Home visitation was simply not practical, but the other ways of following up helped. really appreciate your follow up tips, like jerome asked. Are there other ways of following up rather than home follow up. Can we twitter, email or just leave them at phone calls? How about the case where we cover given them packs in church reception after service, do we still need to stop by and in their house to do the same? The best answer is to learn from your local culture. Where I am, many of these methods are intrusive and like stalking. In other places, a home visit to drop off a batch of fresh cookies is received well. But the church members don’t enter the home, only say thanks for coming and drop stuff off. Hand written notes via mail works well. I’ve not seen an email followup campaign that works – it seems too automated and not helpful. tweets may be too public – someone who wants to be anonymous may not want their church attendance broadcasted. Great info here. Thanks men of God. See you guys in heaven. also,anther thing you can not forget is to pray to ur visitor as ur task! What about altar call people should you ask the to start attending a foundations class the following week and then if they don’t come should you keep calling and inviting them several times? Just in case it is a better week. Should you hound them with questions such as when would you like to come to foundations class what day works for you? What turn? Join a small group! Give clear next steps! I love that! Great tips. Has it been researched if visitors actually WANT contact after the day of the service? Do they feel stalked???? Joy, thank you for the encouragement today. Every fellowship Sunday meeting : Welcoming them by handshakes with a morning wish to each an every individual who are coming to our fellowship, introduced them to the congregation by giving them a round of applause ,having a chain prayers prayed for each an every individual as requested /may be not and my wife started a Tea Party after service. All this work by His love and grace.